Today we bid the West farewell to dig into a Japanese name! 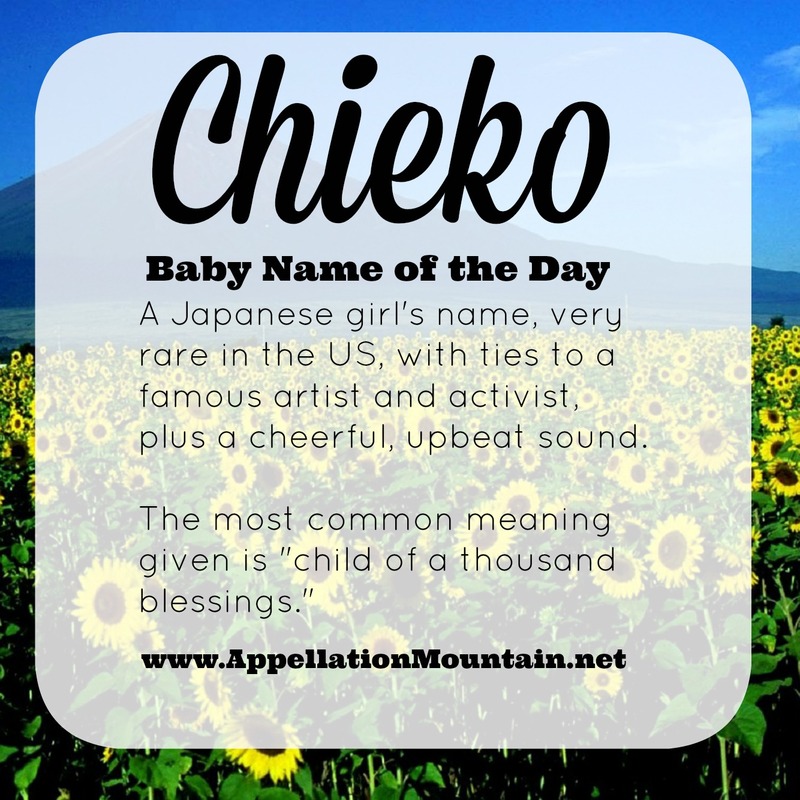 Thanks to Rebecca for suggesting her daughter’s name as our Baby Name of the Day: Chieko. Americans cheerfully borrow from plenty of languages when naming our children. 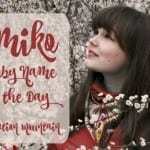 But we tend to stick with Western Europe for most of our name inspiration. Some of that’s just heritage, but let’s face it – there’s a lot of not-so-good reasons that parents have played it safe over the decades. From fear of schoolyard bullies to worries about college admissions and employment, the pressure to choose a fits-in name was once intense. Or even if you were feeling bold, there wasn’t much opportunity to learn about possible heritage choices. That’s changing today, and that’s a good thing. We’re much less likely to feel pressure to Anglicize a name, we have better access to information, and we’re more interested in meaningful names that fit our personal style. And yet, language barriers persist. Japanese names like Chieko are rare in the US. Five girls were given the name in 1991, and 22 back in 1925. The use of Chieko has declined over the course of the last century. Was Chieko a stylish name in early twentieth century Japan? It’s not in the current Top Ten, but perhaps it was once the height of fashion. The pronunciation is more straightforward than you might think: it sounds like chee plus echo. I’ve also seen it spelled Chiyeko and Cheiko. Chieko Takamura was born in 1886. That’s her in the photograph above. Takamura was well educated, and became both an artist and a suffragette. Takamura’s husband, Kotaro was also an artist and a poet, too. His poems about his wife – Chiekosho, Chieko’s Sky – remain widely read. Her story ends on a sad note: in 1931, she was hospitalized with symptoms of schizophrenia, and died several years later. In 1967, Japanese filmmaker Noboru Nakamura directed Portrait of Chieko. The biopic was based on Kotaro’s poetry. 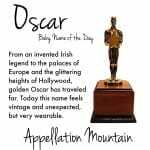 It was nominated for the Academy Award for Best Foreign Language Film. Other accomplished women have answered to the name over the years, including manga artist Chieko Hosokawa, whose long career began in 1958 and has continued into this century. One last silver screen note: the complex and well-regarded 2006 film Babel involved four interconnected stories spanning the globe. Brad Pitt and Cate Blanchett played starring roles, but there was also a young Japanese character named Chieko. The interesting thing about Japanese names is this: the exact same name can have multiple meanings. The sound remains the same, but if the characters – kanji – chosen to represent the name are different, then the meaning changes. I’ve most often seen chi refer to the number one thousand, and eko to child. “Child of a thousand blessings” is one of the more common meanings given for Chieko. I’ve also come across “wise child” and “grace,” so there must be some potential for variation. Japanese names are spectacularly under-represented in the US. And yet, every time I hear one in use, I’m struck by how gracefully they transition to English. Kenji, Jiro, and Chieko. Maybe it’s a bit close to the Spanish chico – boy. But Chieko has a bright, lively sound with that ‘o’ ending – part-Midori, part-Margo. And her ties to Takamura make this name a compelling historical choice, too. Such a pretty name, thanks for highlighting it. I look forward to seeing more examples from Asia.